Emerging technology and advanced medical practice allows our doctors to heal your pain fast! Dr. Craig H. Thomajan DPM, FACFAS, FAENS, the founder and managing partner of Austin Foot and Ankle Specialists has opened the Heel Pain Center of Central Texas to provide an ever-increasing number of patients with the highest level of specialized podiatric medical care. The Heel Pain Center will operate within the same medical office space where Austin Foot and Ankle Specialists is located, at 5000 Bee Caves Road, Ste. 202. The Heel Pain Center will offer a variety of treatment options for individuals suffering from heel pain, including orthotics, pressure stimulation through Extracorporeal Pulse Activation Technology, Plasma Rich Protein injection therapy, MLS Pain Laser Technology and Endoscopic Plantar Pasctiotomy. While foot problems such as bunions, corns and dry, cracked skin affect many Americans on a daily basis, one particular ailment – heel pain – stands out as one of the most commonly experienced, yet least treated, of all foot disorders. According to the American Podiatric Medical Association (APMA), heel pain affects 16 percent of the population regularly. While millions of Americans every day experience this and countless other foot ailments, it’s important to remember that foot pain of any kind is not normal and should be taken very seriously. 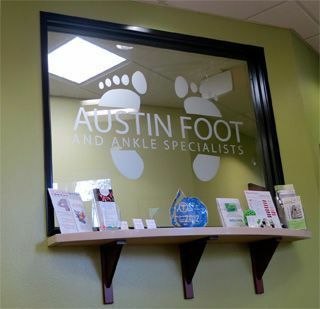 The need for a new specialty clinic to address the issue of heel pain was made evident by the number of patients experiencing this issue in our day-to-day operations at Austin Foot and Ankle Specialists. "Four out of 10 individuals with foot pain are inhibited from performing their regular daily activities, and it’s our goal to help get our patients back on track as soon as possible through a variety of treatment options ranging from orthotics and pressure stimulation to plantar fascia surgery."